Rachel Benbow Murdy and Margi Sharp Douglas in The Millay Sisters. BOTTOM LINE: An episodic drama—with frequent musical interludes and the reading of poems—about Edna St. Vincent Millay’s relationship with her younger sisters. As the audience enters The Gowanus Loft to see The Millay Sisters, it’s as if they’re entering a small café. Round tables have been set up in front of the stage; each has a lit candle in its center and is surrounded by four chairs. As the ticketholders make themselves comfortable, a stout woman—clearly in charge of everything—bustles around and introduces herself to patrons as Norma Millay Ellis (Rachel Benbow Murdy), the younger sister of poet Edna St. Vincent Millay [1892-1950]. As she masterfully, and with great charm, welcomes each guest, she asks for volunteers to read some of her acclaimed sibling’s poems. Anthologies of Millay’s work have been strewn around the room, and several people jump at the chance, reading sonnets and rhymes to the assembled crowd. It’s an intriguing opening. Unfortunately, the energy dissipates as the play unfolds. 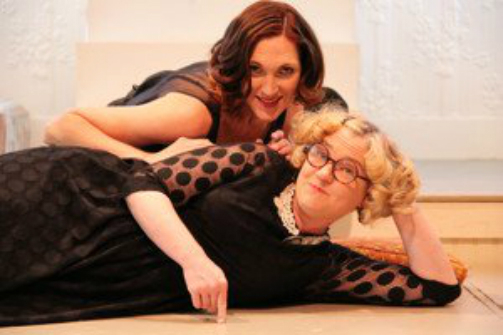 Although the acting is spectacular—both Margi Sharp Douglas as Edna (known as Vincent to her family, friends, and colleagues) and Rachel Murdy as sister Norma are compelling and charismatic performers— the play reveals snippets rather than a coherent narrative about their lives. We learn, for example, that St. Vincent was not a family name, but was a tribute to the now defunct New York City hospital that had saved an ailing relative. We also learn that Vincent was the first woman to receive the Pulitzer Prize for poetry; that she and her siblings were reared by a single working mother; and that the family struggled mightily to make ends meet. There’s also reference to Vincent’s bisexuality, her non-monogamous marriage to Dutch importer, Eugen Boissevain, and her drug and alcohol dependence. But it is her relationships with sisters Norma, one year her junior, and Kathleen, four years younger, that form the crux of the story. Although Kathleen, or Katie, is frequently referenced, she is never seen; nonetheless the antipathy between Vincent and Kathleen is highlighted, if only partially explained by Katie’s desire to be as rich and famous as her well-regarded sister. Similarly, it’s hard to understand how Vincent transformed from a shy, sheltered kid in rural Maine to become a bubbly college coed and then a major force in the burgeoning literary scene in Greenwich Village following World War I. Likewise, her eventual descent into morphine and alcohol addiction is described, but leaves many questions. Lastly, although Norma is portrayed as fawningly loyal and servile, she also demonstrates a quick wit and sassy persona, traits that seem at odds with her role as helpmate. Was she, like Kathleen, envious of Vincent’s renown? Or was she truly content to sing duets with Vincent and serve as her confidante and frequent rescuer? Although the play is entertaining and at times touching, it does not delve as deeply as it could into relational rivalry or the love-hate see-saw that many siblings ride. It also says nothing about the political milieu in which the Millay sisters lived—from the Roaring Twenties to the Great Depression. Still, David Barber’s set is gorgeous, Peter Szep’s piano playing is excellent, and the songs are delightful and well-presented. That said, I wanted more and immediately went to Wikipedia when I returned home to learn additional facts about Ms. Millay’s life and work. Perhaps that’s exactly as the playwrights intended. If so, The Millay Sisters does its job well, introducing—or perhaps reintroducing—viewers to this audacious, bold and troubled poet. The cast includes Margi Sharp Douglas and Rachel Benbow Murdy.